The following takes a lot of work and commitment and I really would recommend that you bring in a professional to guide and help you along the way as this can become a very serious condition and almost always get worse. Additionally, there are other modifications, which are not directly related to storm fear which will assist in making your dog feel more secure. You are welcome to contact me at admin@fods.co.za and if I cannot assist you will put you in touch with somebody in your area. Although changing this behaviour is not hard to achieve, it takes a lot of time and owner commitment in order to bring about the changes.A further difficulty is that while undergoing the modifications, it is vitally important that the dog is not left alone for longer than it can tolerate, which is not always easy to achieve. So if you do have to go out for a period of time, rather employ somebody to dog sit. Additionally, dogs that have suffered separation anxiety are more likely to revert to this behaviour if they incur new stresses in their lives, so be vigilant and watch for signs of this developing and address immediately. What is important to realize is that the dog is not being mean, bad or spiteful. You are dealing with a dog wherein the stress levels have become so high that the dog is actually panicking. Stress is not just anxiety - it has chemical components involved. Many dogs can handle high stress levels whilst in other dogs, small amounts of stress with cause a reaction. When the stress threshold is too high, electro-chemical reactions take place and this is then termed a stress response or over stress. This, in turn creates a chemical and functional disturbance and a flood of chemicals surge into the brain – the dogs fear is very real. To engage in any type of punishment will only destroy the human/canine bond and make the dog even more stressed, as it will relate the punishment to the owner, rather than the behaviour the dog engaged in whilst owner was out. Dogs live in the ‘moment’ and associate punishment with the very last thing that happened (coming to the owner), rather than with behaviours that happened when owner was out. If your dog has already become destructive, then remove all items that he has being chewing on. If this is not possible (doors for example), then rather try putting on some pure Citronella oil and if this is not strong enough, then purchase a product such as Avert from your vet to apply to these surfaces. Additionally, use management to stop the dog going into bedrooms or room where destruction has already taken place. If the dog is over attached to one person in the home, then if there are other people in the home, they are to take over as much interaction with the dog as possible - this will lower the dependence on the owner. I do not mean that the owner will totally ignore the dog - this is simply cruel - rather that somebody else will start to do rewarding things with the dog such as feeding, some TTouch or Acupressure, taking the dog out for a walk etc and the owner will keep their interaction with the dog to a minimum - but NOT ignore the dog. Change your thinking and attitude towards the behaviour! We, as humans have a habit of labeling things i.e. ‘my dog has separation anxiety, or my dog is aggressive’ etc. Coming from a background of being a Louise L Hay practitioner, I know how much impact positive and negative thinking can have, and so I suggest to my clients that they begin a simple affirmation of ‘every day in every way you are getting better and better’. Every time you look at the dog, think of the dog, interact with the dog, either say out loud or to yourself this simple phrase. As simple as this may sound the constant affirming of this sentence does bring results. This is based on work that Dr. Emile Coue did in France in the early 50’s. He ran a clinic and had 50% of the patients repeat this phrase to themselves for only two minutes per day. The other 50% did not take part. At the end of a two week period, there was a dramatic improvement of health in the 50% of patients who had undergone this exercise. At the same time, start to notice the small increments of improvement that do occur and pat yourself on the back for all your hard work! We so often expect instantaneous results, and especially in situations such as separation anxiety, it can take time – so do make notes of the improvements and realize that progress is being made. I often suggest to my clients that they start a ‘dog diary’. Then you can note down the changes and see that you are actually making progress. Are your dog's needs being met? When I go to see clients with behaviour problems, the majority of the time the owner has just not realized that the dogs needs not being met may be part of the reason for the anxiety when the owner leaves. the dog may not receive sufficient mental, physical and social stimulation, which could be contributing to the behaviour. This does not mean not that they are bad owners, that they are looking for solutions shows what good owners they are. What so often happens is that we buy our dogs toys but do not realize that a ball or rope, without somebody either throwing the ball or pulling the rope, can only provide limited stimulation for a dog. Many dogs are left at home during the day and they have very little to entertain themselves. Simply by providing your dog with the correct toys, such as one’s that are interactive. I do prefer that these toys are only given when the owner is out – here are a few ideas and always make sure these toys are safe and sturdy (dogs do chew and can swallow items) and inspect them on a daily basis for signs of breakage. An additional factor is that we will be giving the dogs something else to do and look forward too- this will reduce the concern over the owner not being home. Toys that can be stuffed such as Kong’s/Busy Buddies and similar toys. As these have a hole at each end, they can be stuffed with goodies and given to your dog to keep it busy while you are out. Here is a link to 50 Recipes to stuff a Kong for ideas and a link to Pet Systems where you can buy Busy Buddy Squirrel Dudes which are perfect for this. Many people believe that because they either have a large garden for the dog to play in, or they play with their dog daily that this will give the dog enough physical exercise – not so! A dog’s sense of smell is 45 times stronger than us humans, and this is approximately 200 million more scent cells that we have and in the hound breeds this can be 450 million more scent cells. A walk for a dog is not just something that should happen once a week, it is something that a dog needs and not only that, it will give your dog something really rewarding to look forward to rather than just focusing on the owner. When you do have the time to take your dog for a longer walk, if you are lucky enough to have a situation in that you have somebody who works for you, or a friend that can help, then take them with you on these walks. Initially you will hold the lead and when the dog is relaxed on the walks, start to give the other person the lead and let them walk a few steps in front of you. Building up the time period the other person holds the lead will give the dog confidence and allow it to get used to the other person. A nice way to build the dogs self confidence and lessen its dependency on you, the owner. On the walks look for ways to build the dogs confidence further by finding things the dog can jump over, go under etc – almost a mini agility walk. Don’t always walk the same route; look for different places to walk. As mentioned in the section above, this will provide something else for the dog to look forward apart from owner coming home. If you have a dog that follows your every move, then you are going to start very slowly and do the following. Stand up from your chair and if your dog follows you, then walk into the kitchen (for e.g.) to make a cuppa tea and close the door behind you - turn around and walk straight back out shutting the door behind you.Until your dog does not react to this, just keep on practising in this manner. You will gradually build up the time period so that the dog can cope and please dont be in too much of a hurry with this - the most important part is to go slowly and with what the dog can cope with. Practice this as often as you can. When I say as often as you can, I really mean do it a lot – not just 3 or 4 times per day, but over and over. Gary Player once said “the more I practice the luckier I get”. Remember no interaction with the dog when you do this – no talking, looking at it etc, just a straight walk out the room and straight back in. You are starting to leave the dog for very small increments of time that it can cope with. Think of it like this – would you follow your boss around the office? As the person in charge in the combined human/canine social structure, it is up to us to decide where we go and who goes with us. A simple exercise like this will once again raise you up in the combined human/canine social structure and very gradually getting your dog used to being without you and build its self confidence. Very gradually build up the period of time until you can leave the room for about half an hour. Again, at the risk of repeating myself, please don’t go too fast, it is crucial with a dog suffering from this condition that you never ask the dog to do too much. A good idea is also to stagger the time period. If you have worked up to the dog being left for 5 minutes with no problem, the next time reduce the time period to one minute and continue to stagger. Too constantly increase the period the dog is alone can lead to stress. Always return to the room before the dog stresses. When you have built up the time period to a fair stretch of time, keep practising this daily, so that the dog gets used to you being apart from it. 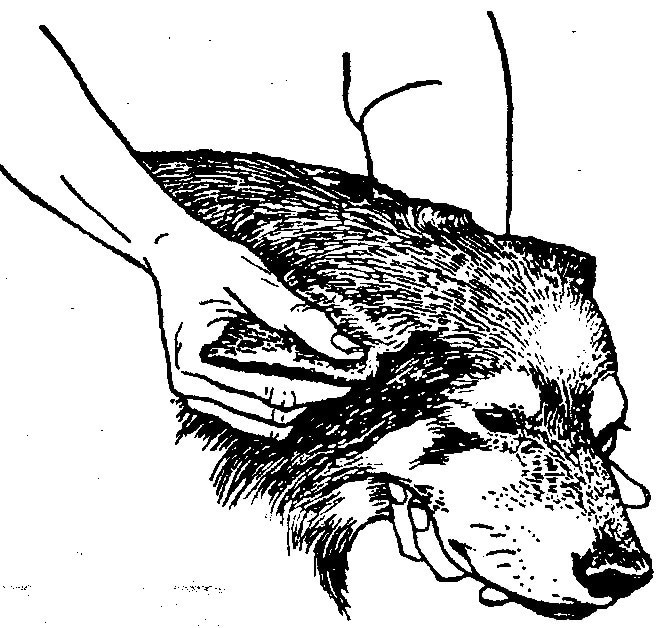 I would suggest practising this in all different areas of the home, in order that it does not become habitual with only one room being used for this exercise and what is important as dogs don't generalize, is to start at the beginning again each time you start to use a different room for the exercise. If you have a back garden then do the above exercise here as well, unless it is a garden in front of the door which you normally leave by. Just walk out the door, stand for a few seconds then return. Again you will work at increasing the time period and distance you go away from the door into the garden. Your dog by now should be getting pretty good at being alone for short periods of time within the house, and we can now take this exercise further. Invest in a raw Femur bone from your butcher, in fact buy a few and freeze them rest. A bone such as this is excellent as the dog is not likely to break off and swallow pieces. When not in use, just pop it in a plastic bag in the fridge. Take out the bone when the dog is with you and offer to the dog. As the dog really gets stuck into it (about 4/5 minutes), then pick up the bone and return to the fridge (make sure first that you can take objects away from your dog without a problem). About a half hour later, offer the bone again and repeat the first part of taking the bone away when dog is really enjoying it. Do this 6/7 times during the course of a day (more if possible). By the end of the day, this bone will have become the most important thing in the dog’s life. The following day, show the dog the bone and if you have a back garden, pop the bone outside with the dog and return inside shutting the door. If you live in a flat, then put aside a room to practise this in. Only leave the dog a minute initially, and then take away the bone as in the first part. Do this over and over during the day. The following day you can start building up the time period, but as I have said repeatedly, do this very slowly and take the bone away before the dog stresses or looses interest. We are now changing the dog’s perception of being alone from a stressful event to a pleasurable event. It is vitally important that the dog does not have access to this bone at any other time. Now comes the time to start getting your dog used to you leaving the home and the first thing I normally do is to desensitize the dog to keys as they seem to be a major trigger some many dogs. If your dog reacts to you picking up the keys and starts to stress, then get into the habit of picking up the keys and putting them down, change the place you keep them and practice this for a few days, picking up the keys in all different locations and also building up the duration you hole them. If your dog does react to keys, then I would not continue further until the dog is not longer reacting to the keys. As dogs (and we humans) are creatures of habit, the fnext thing you will do is to change your routines i.e. if you always leave your bag or keys on the kitchen counter, change the location. If you always use the front door for leaving, then start using the back door. In fact the more you change your habitual leaving home leaving patterns the better. Get yourself ready to leave, without interacting with your dog and walk out the front door. Stand there a few seconds then walk back into the room and put your belongings down and make yourself a cup of tea, or similar. Then stand up and repeat the procedure. Do this over and over (and did I say over??) until the dog is not at all phased as to what you are doing. If you are using the bone, then take it away when you come back into the room. Build up the time period slowly until you can stand at the front door for about 5 to 10 minutes with no reaction from the dog. Now is the time to take this further. Repeat the above procedure, but this time walk out the door, shutting it behind you. A few seconds later, walk back in and repeat the sitting down procedure etc. Even though you may have build up to a five minute wait at the door, you are now changing the goal posts and it is essential that you again shorten the time, and in this case I would say to a few seconds, even going out, shutting door and coming straight back in. If at any time the dog is not coping, simply go back a step and stay at this particular time period (remembering to stagger) until the dog is coping well – this cannot be rushed!